Sony player all about "sound and vision, iPod about apps and games"
Then Sony X-Series Walkman. It's not like an iPod, OK? 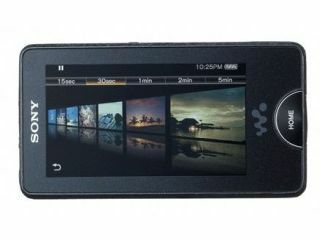 Sony has formally announced its adversary to the iPod touch – the X-Series Walkman. UK Walkman head Wes Deering tells us he is bullish about the new player, saying it is "incomparable" to the iPod. Deering immediately set out the agenda for the new X-Series device – it's all about "best in class sound and vision" he said, "getting back to what Sony does best. The experience you get for both sound and vision is incomparable to anything else on the market." Strong talk. The stage for the launch couldn't have been stranger - a disused tube line deep under London's Charing Cross where possibilities for getting to grips with the X-Series' Wi-Fi capabilities was somewhat limited. Deering acknowledged that the new device "will be compared to an iPod touch probably because of price point and because it has a touchscreen." But, almost unbelievably, he then stated that "ultimately the two products do very different things. "The X-Series is all about best in class sound and vision, whereas iPod is about apps and games. This is about the best sound quality for your music and best picture." Sony also believes it has struck gold in terms of the look and feel of the X-Series. "The graphite granite finish on the edge – it's very well-built," eulogises Deering. "It's everything you'd expect and we've improved massively [in terms of usability] even scrolling through the album art. We've looked at the details and got the details right." And by large we'd agree with him. The finish feels good and solid, while the physical controls for standard functions – volume, noise cancelling, home and hold - are welcome. But sadly the 3-inch screen really is noticeably smaller than the iPod/iPhone's even if it is sunnily crisp. As for sound, well it certainly exceeded our expectations – even if Sony first demonstrated the unit with different headphones than are supplied with the X-Series out of the box. "The noise cancelling is built in, but these headphones facilitate it [points to microphone on headphones]. These are high quality EX headphones, £40-£50 worth of headphones," says Deering. "But you can also change the noise cancelling settings depending where you are as the noise cancelling will be different on a plane than it is on a tube. It's digital as well – up to 99 per cent noise cancelling versus analogue which sits between 70-80 per cent," he explains. Deering was quick to point out the universal format appeal of the player, even if "outside of our video formats, the consumer would need to go onto the net and find an encoder for that format." But the Walkman boss adds that a big sell is the access (via PC download) of iPlayer content in WMV. Sony has certainly changed in terms of its outlook on proprietary formats. "We support that open format for the consumer so they can choose to download what they want and where to download it from. "We used to have our own proprietary software and we came away from that and it's not something we're going back to." We asked Deering to talk us through the OLED display and Sony's reasons for using it to set the X-Series apart from the pack. "In terms of colour reproduction, the contrast ratio sits at 10,000:1 - versus an LCD panel on another MP3 player, 250 to 300:1. So hugely different, what you actually get is much deeper colours, much blacker blacks, the kind of thing where you can see crows in the dark," he says. "So it's great for watching action films. Has a quicker response rate as well so great for watching sports. And it also uses a lot less battery than an LCD, you can actually watch OLED quality film for eight hours without having to recharge. OLED is a great technology." Want one? "It'll be available to buy on SonyStyle from tomorrow, so feasibly you could have it by the weekend," says Deering.